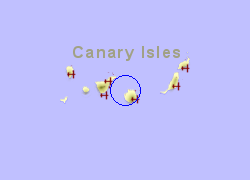 Map of the Agaete Ferry Port area. The small port of Agaete on the west coast of Gran Canaria is the nearest ferry port on that island to Tenerife (a distance of approximately 70km). 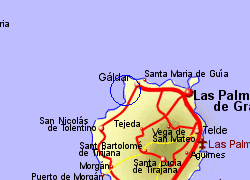 The port and town of Agaete has a good road connection to Sant Cruz de Gran Canaria via the GC-2, the 35Km journey taking around 30 minutes by car. The 90Km journey to Maspalomas in the south of the island is likely to take a little over an hour. 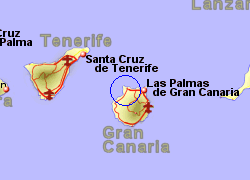 A bus service runs approximately every hour between the port and Santa Cruz de Gran Canaria, from where there are connections to other parts of the island. Operated by Fred.Olsen Express with 6 crossings per day, crossing time 1 hr 20 mins.